While there are a few battered-and-fried-berry recipes (you know that there's a recipe to batter and fry just about anything...), one of the interesting things about Bella's recipe, seen above, is the addition of the cornmeal. While it may seem like a great ingredient to simply mop up oil, it creates a really nice texture that's not mushy or soggy -- as if you couldn't tell from her ridiculously delicious photo! Bellissimo! 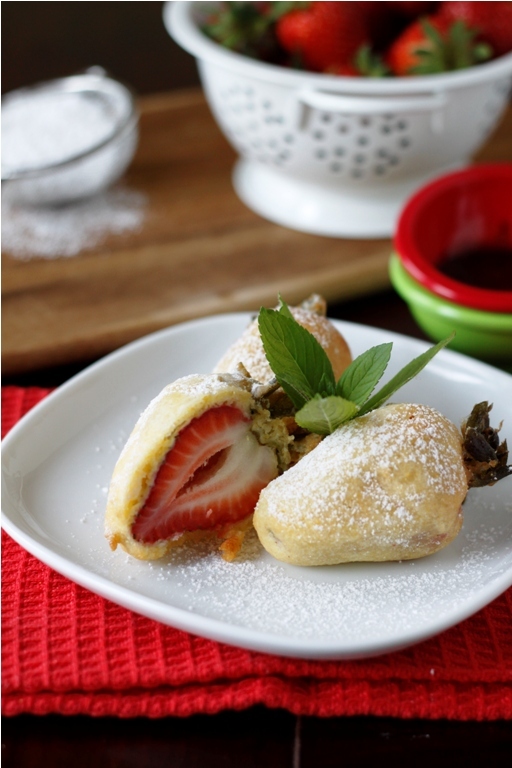 If you thought those Cupcake Stuffed Strawberries were amazing, what until you try these! Hey, if it has fresh fruit, it's healthy - right?! For the full recipe, visit The Family Kitchen. Photos by a.guzman and The Family Kitchen.